파워&에너지 계측용 내장 PC 인터페이스 검출기 출력 옵션으로만 구매 가능. The INTEGRA is a meterless line of all-in-one detectors that combine a detector and a meter in one convenient product. The small but powerful meter of the INTEGRA series presents a direct USB or RS-232 connection so you can plug it into your PC or acquisition system. 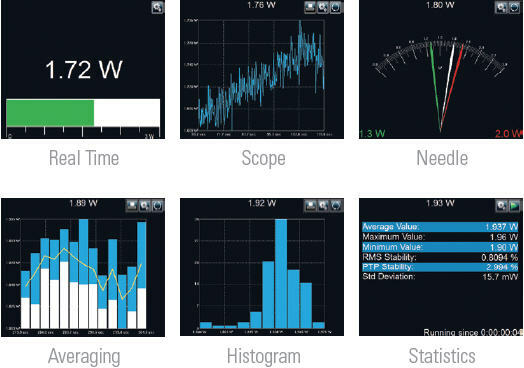 Simply use the PC-Gentec-EO software supplied with your product and be ready to make power or energy measurements within seconds! Each detector of the INTEGRA series offers the same incredible performance as the usual detector and meter combination, from pW to kW and from fJ to J. And the good news is that all our most popular products are available with the INTEGRA option. Plug your detectors directly into your PC with the INTEGRA embedded monitor. INTEGRA detectors offer the same performance as the usual detector + monitor combination. 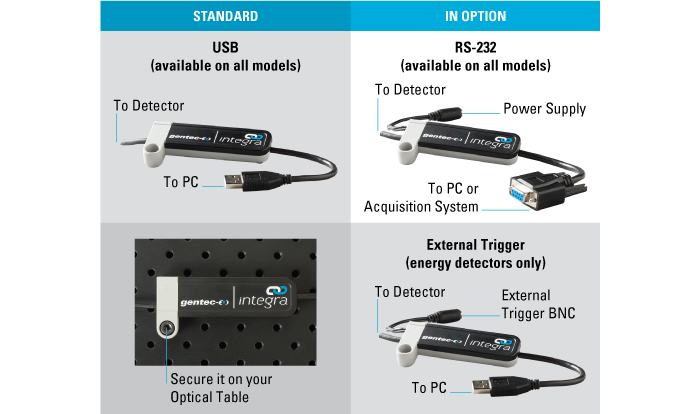 INTEGRA detectors are offered with a choice of USB (standard) or RS-232 connector (in option). A 0-2V external trigger is available in option on every compatible INTEGRA energy detector. Perfect for the lab, OEM applications and field servicing. No need to carry a meter! One product = one calibration. Reduce your recalibration costs by half! Control your INTEGRA detector with the same powerful software as the MAESTRO. Firmware for Integra original/black PH series only. Connection: connect or disconnect your device. Controls: turn the turbo mode on or off, make a zero to remove the thermal offset, start the acquisition of the data and start the calculations of the statistics associated with this data. Startup config: save your measurements settings or load the settings associated with an already existing file. Help: get information about the PC-Gentec-EO software and read the user manual. Measure: configure the parameters related to your measurements. Display: set the desired number of digits and settings associated with the selected display. Acquisition: enter the parameters related to the acquisition of data. Wavelength: enter the wavelength of your laser and the software will apply the appropriate correction factor on the measurements. 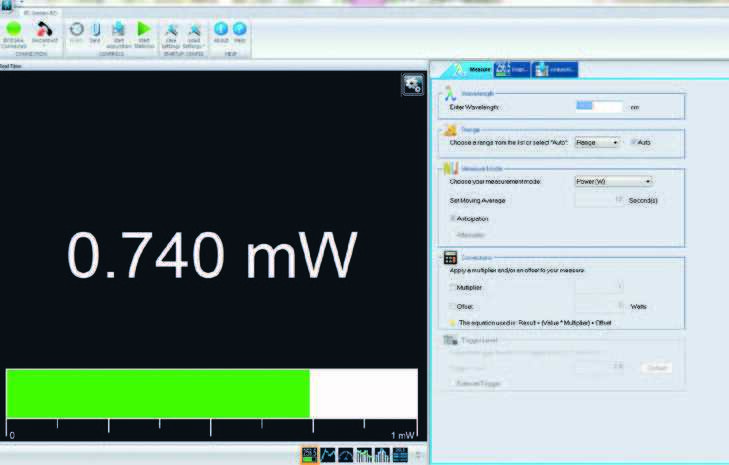 Range: set the power or energy range to a fixed scale or let the software automatically adjust the scale. 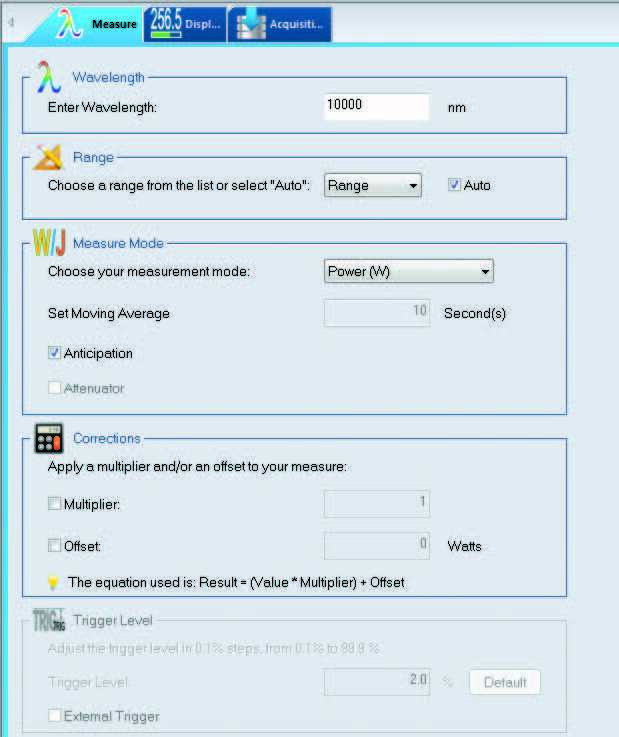 Measure mode: select the type of measurement that will be displayed (power, energy) and let the software know if you want anticipation and if there is any attenuation. Corrections: apply a multiplication factor and/or an offset to your measurements. Trigger Level: set the trigger level in 0.1% steps, from 0.1% to 99.9% (in energy mode only). Power mode: choose a sampling rate (number of measurements per interval of time), a total duration (in days, hours, minutes and seconds) for the data acquisition, a time stamp for each value and the file name and file location. 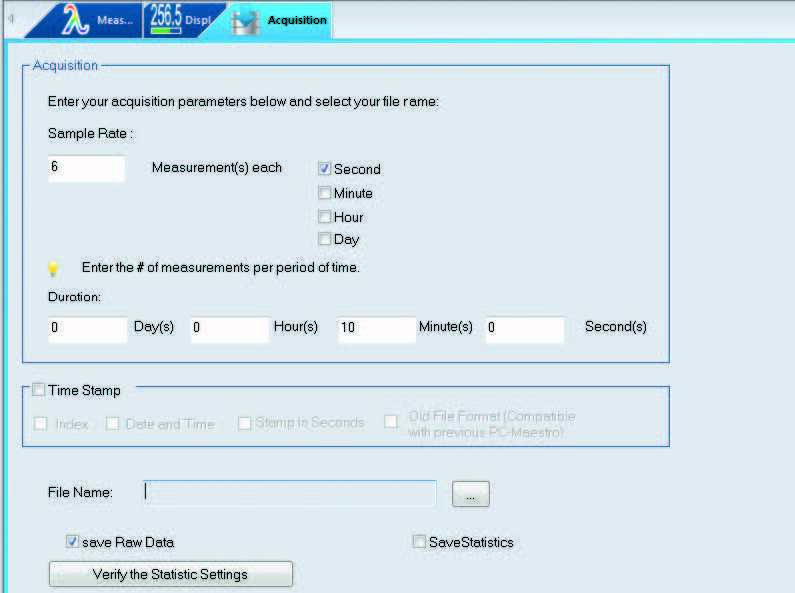 You can choose to save only the raw data and/or the statistics associated with your data acquisition. Energy mode: choose a sampling rate (1 pulse out of X pulses), a total duration (total number of pulses) for the acquisition of data, a timestamp for each value, the file name and file location. Decide if you want to save raw data and/or the statistics associated with this data.